It’s 6 AM at the Y.
the treadmills, the water aerobics and yoga classes. to steeper inclines and higher speeds. of temper tantrums or parental controls. of classes and trainers, have I ever achieved. if she would like to quit early and join me for a cup of coffee. From The Lovely Mundane (Finishing Line Press). 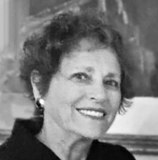 Anita S. Pulier, after many years of practicing law in New York and New Jersey, served as a U. S. representative for the Women's International League for Peace and Freedom at the United Nations. Currently, she is a Trustee of the Jane Adams Peace Association. Anita’s chapbooks, Perfect Diet and The Lovely Mundane, were published by Finishing Line Press in 2011 and 2013, respectively, and her poems have appeared in numerous online and print journals. Anita and her husband divide their time between New York and Los Angeles. Learn more about her at http://psymeet.com/anitaspulier/. Anita's poem is my best laugh today. The poem is well built and I envy her ability to quit. I love the humor in this, but agree with Ross and Jancan that there should be pie or cake, something REALLY enjoyable, even a Cinnabon. Who said that a handful of M & M's takes 2 hours to burn away? My sentiments exactly! Well done and amusing. Always up for the cup of coffee - not so sure about the exercise beforehand though... oops, time to catch the bus to town for my daily latte therapy session. What a superb poem - thank you!